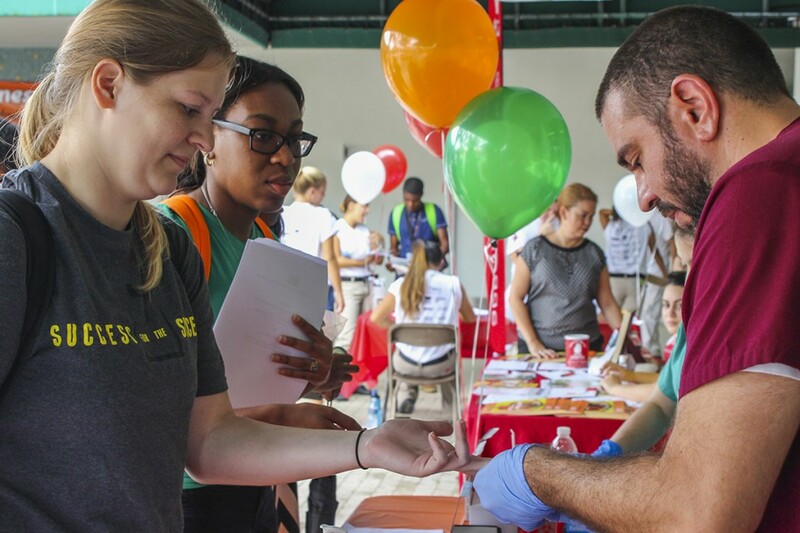 In an effort to raise awareness of the risks associated with diabetes, the University of Miami School of Nursing and Health Studies partnered with the American Diabetes Association (ADA) to host the second annual UStop Diabetes event on the Lakeside Patio Wednesday afternoon. UStop Diabetes served as a “no excuse” event. It provided free testing by professional staff, who conducted blood glucose and hemoglobin a1c screenings. A blood glucose screening provides a quick snapshot, while a hemoglobin a1c screening views blood sugar levels from the past six months. Founder and UM alumnus Jose Hernandez- Solaun, a board member of the ADA, said he started the event to educate the younger generation of diabetes’ alarming presence in the U.S.
Those with diabetes are at a higher risk for health complications such as blindness, kidney failure, heart disease, stroke and loss of toes, feet or legs, according to the Centers for Disease Control and Prevention. UStop Diabetes provided students with options to help prevent diabetes from becoming a part of their daily life. Some of the suggestions included weight watching, healthy eating and exercising. During the event, students had the chance to sample healthy food options, like dragon fruit and protein shakes. There were also dances facilitated by the staff. JC Del Valle, assistant VP of government and community relations at the ADA, wanted students to know that as long as people have unhealthy habits, regardless of their body type, they are susceptible to the disease. Diabetes is one of the fastest killer of Americans, passing AIDS and breast cancer. Hernandez-Solaunt believes that it is on the incline because of America’s fast food traditions and hearty meals partially at the fault of older generations. Unlike Type I diabetes, a pancreatic defect in which the pancreas does not produce sufficient amounts of insulin, Type II diabetes is completely preventable. All of the supplies for testing were donated by the ADA.